ECOLIFE conservation produces organic lettuce, tomatoes and cucumbers, with 90% less water. ECOLIFE Conservation, an NGO headquartered in Downtown Escondido, unveiled its new Aquaponics Innovation Center in rural North Escondido. The center produces organic lettuce, tomatoes and cucumbers using 90% less water than traditional “dirt” farming. In addition to providing a sustainable source of healthy produce to local non-profits, the Innovation Center also provides opportunities to educate school children and the greater community about the benefits of aquaponics. At its test and research facility in Escondido, ECOLIFE designed and built a 900 ft2 system capable of growing 333 lbs. of tilapia, 1,600 heads of lettuce or a combination of lettuce and high-value tomato and cucumber crops in a recirculating system. The innovative design features solar powered mechanical filtration, mineralization tanks, and backup power to keep water circulating in the event of a power outage. ECOLIFE partnered with Calsense, a leader in high-tech resource management to add state-of-the-art monitoring allowing ECOLIFE to monitor water use and quality in real-time. “With this system, we will be able to track in real-time, exactly how much water is needed to grow protein and vegetables. We anticipate a 90 percent or more savings on water when compared to conventional agriculture. Systems like this can be built anywhere, under any hydrological conditions. Aquaponics truly could be a game-changer for drought-stricken California,” says A.J. van de Ven, President of Calsense. “This system features state-of-the art filtration, cloud-based real-time monitoring, and is designed to grow 1,100 heads of lettuce and 30 tomato plants simultaneously. We’re proud to be able to demonstrate that you don’t need a lot of water to grow quality produce. And on top of that, it tastes great. 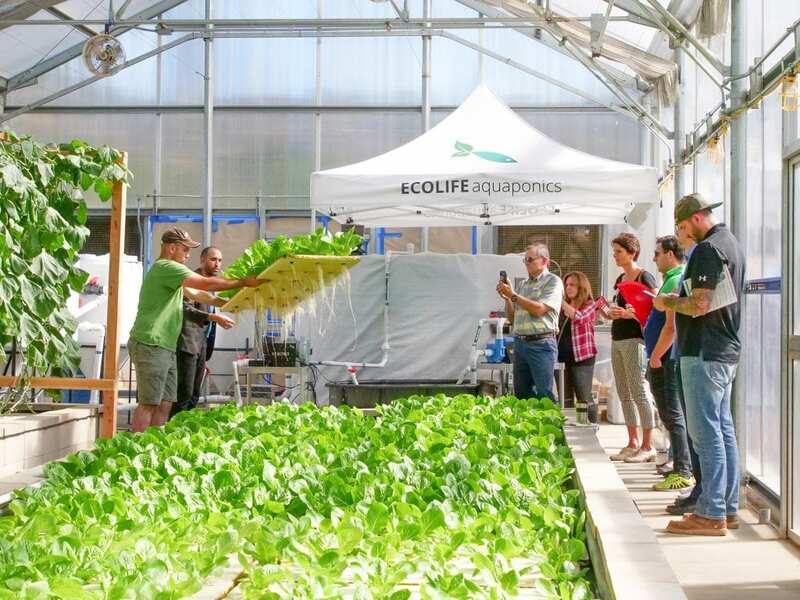 Aquaponics is the future of food,” says Martin Niwinski, the Aquaponics Technician for ECOLIFE who designed and built the system with a team of interns and volunteers. ECOLIFE has been growing vegetables and designing aquaponic systems for 15 years, including the desktop ECO-Cycle Aquaponics Kit, a tool for STEM (science technology engineering math) education that fits on top of a fish tank. In addition to placing the ECO-Cycle Aquaponics kit in 641 classrooms the team has built nine systems in San Diego Title 1 schools and will now begin designing a community-sized system in partnership with the Bayside Community Center in Linda Vista to provide fresh produce to underserved areas of San Diego.